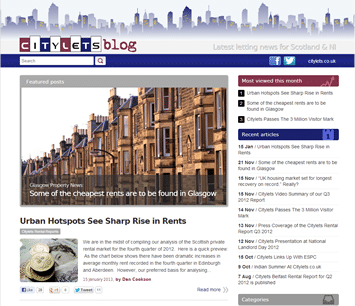 Citylets are a letting portal with an emphasis on Scotland and Northern Ireland. As the leading letting site in the UK by pageviews, one of the services they offer to their clients is timely, insightful analysis of the letting market. Their blog is a key way of getting traction with clients, the press and end users by providing useful information that is not available elsewhere. They felt their old design was too dull and was putting off readers – it also didn’t reflect the innovative, dynamic nature of their company and the value of their unique analysis. We developed a standalone blog that took design cues from their main site and corporate look, but made it a bit more fun and also easier to update without “breaking” the design. The “trademark” citylets skyline image has parallax scrolling when the mouse is moved. Our blog design is fully responsive and resizes for comfortable viewing on desktop PCs, laptops, iPads, mobile phones and everything in between. The page layouts include optional images and a “featured posts” carousel on the homepage draws attention to the stories that have priority. The blog also has a sidebar where standard WordPress widgets can be added and are automatically incorporated into the look and feel of the site. Spam comments were a problem in the past, so the Disqus comment plug-in was used to reduce the incidence of spam and also make it easier for users to comment using their existing credentials from other sites.